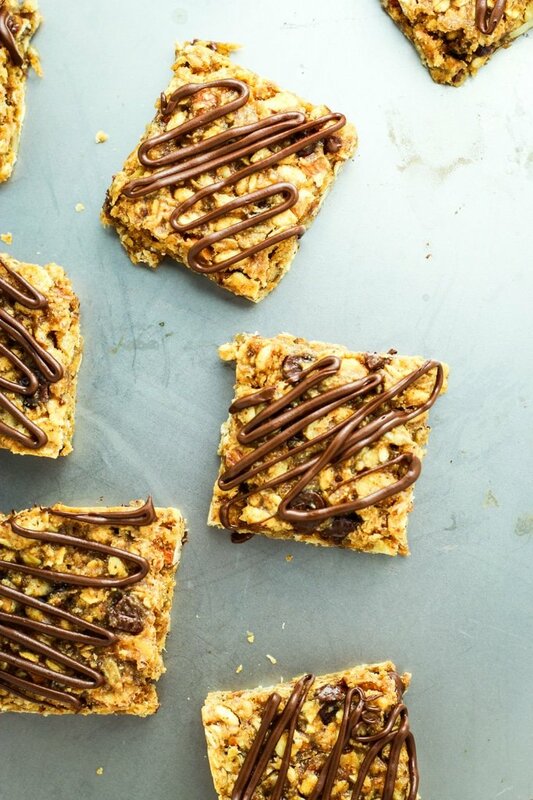 These salted chocolate granola bars are easy to make and cheaper than store-bought. They can easily be made with vegan chocolate or sub dried fruit for the chocolate! Salted. Chocolate. Those are two of my favorite words, together or separate. Today, they’re getting together. All up in these sweet and salty, wholesome granola bars that you can (and should!) make at home. Has anyone else noticed how long it’s been since I posted a not-savory recipe? No? Just me. You guys are too kind. I know there have to be some of you out there who appreciate a breakfast or dessert recipe now and then, right? This one is for you and for me and for all of the people out there who know that homemade is better for you and your budget. If you have spare time on Saturday or Sunday, just mix up the dry ingredients and whisk together the wet stuff. Mix, bake, and cut them, then bag them up and enjoy all week long. 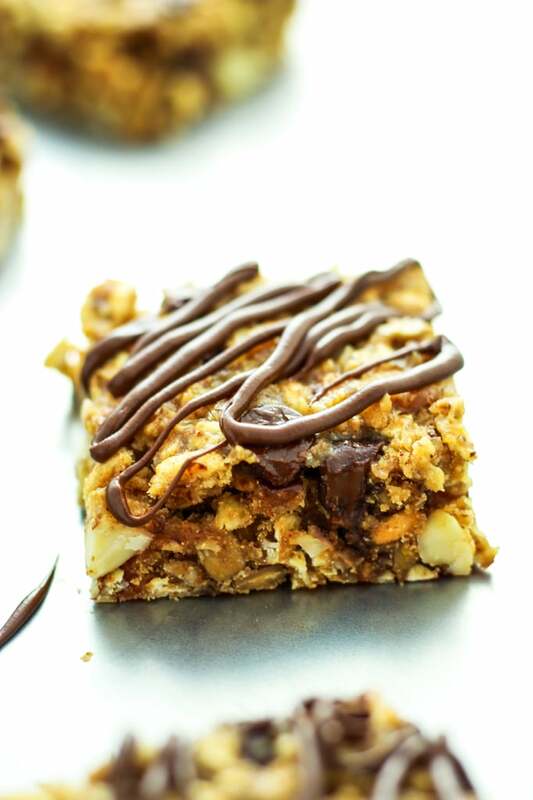 These granola bars are tasty with or without the chocolate drizzle on top. They’re not overly sugary, which I know is good for breakfast-time. But if you’re like me and you see the merits of a little sweetness to start the day or satisfy your snack needs, just do the chocolate. 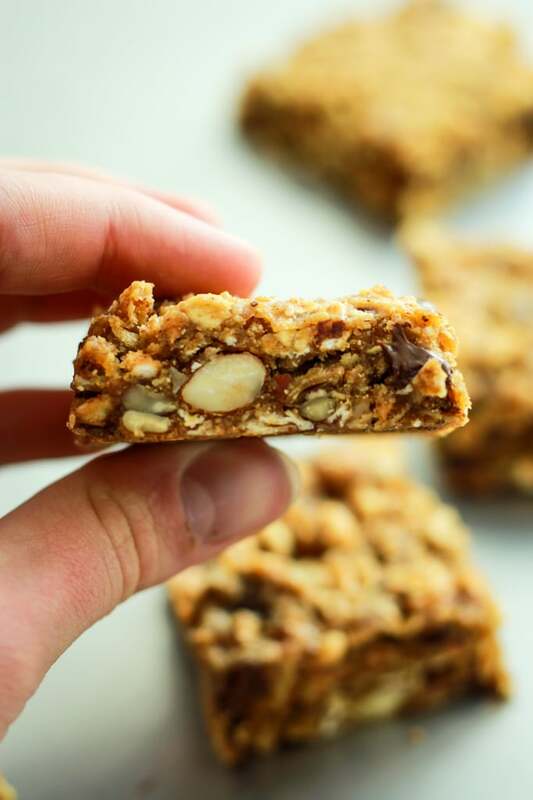 I loosely based this recipe off the granola bars that I found in the Chickpea Flour Does It All cookbook from Lindsey Love, the blogger behind Dolly and Oatmeal. I mixed things up a bit because I don’t like goji berries or cacao.  Regardless, this girl was not kidding when she named the book. I had no idea how versatile and useful chickpea flour really is. I mean seriously – you can make everything from granola bars and cakes to pasta noodles and vegan frittatas. PS – This is not sponsored and Lindsey did not ask me to shout her out. I actually won the book from a USA Pulses contest on Instagram that I didn’t even know I entered! Winning. 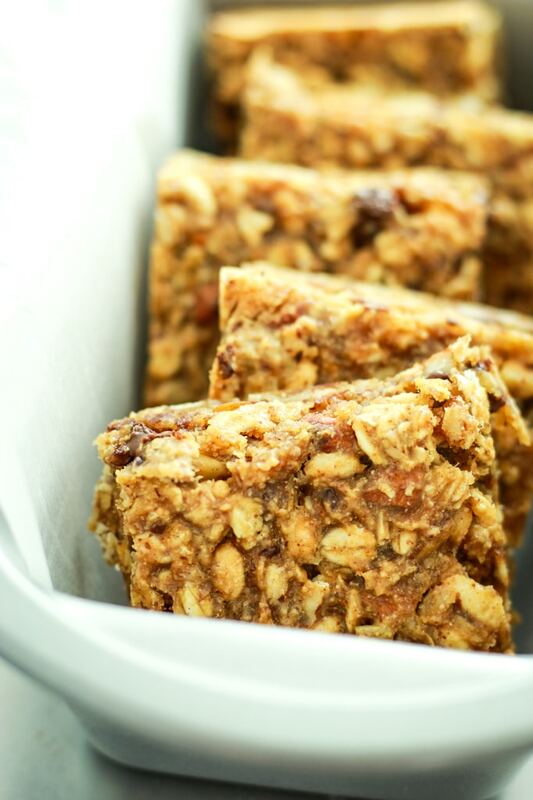  Make these granola bars for yourself and you’ll be winning too. 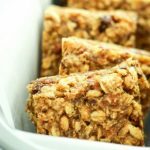 Salted Chocolate Granola Bars – EASY to make, homemade granola bars. And cheaper than store-bought. Can be made with vegan chocolate! Preheat oven to 350º and line an 8″ x 8″ square pan with parchment paper. set aside. In a large bowl, whisk together the flour, puffed rice, oats, almonds, chocolate chips, sunflower seeds, cinnamon, and salt. In another bowl, whisk together the almond butter, applesauce, brown rice syrup, coconut oil, and vanilla. Pour the wet ingredients into the dry mix and combine thoroughly with a rubber spatula. Transfer the mix to the prepared pan and use the back of the spatula to spread the mixture evenly into corners and sides of the pan. Bake for 18-20 minutes until the top is golden brown. Allow to cool and cut into 2″ squares. 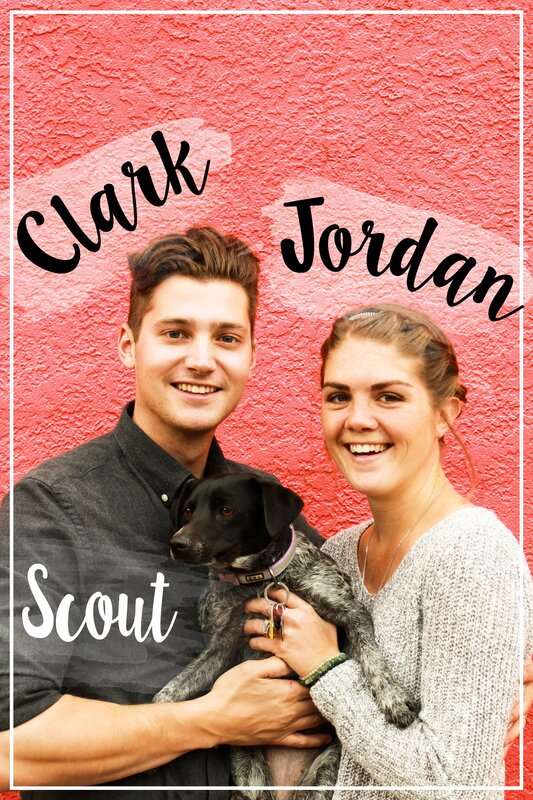 This recipe makes 16 – 2″ x 2″ squares. *If you can’t find puffed brown rice, check your cereal aisle for rice cereal similar to Rice Krispies. We use Arrowhead Mills puffed brown rice. Can you use maple syrup instead of brown rice syrup? Hi Jamie! Since brown rice syrup is much thicker and stickier, I’m not 100% sure how maple syrup would work. If you try it, I would recommend using a smaller amount than the amount of brown rice that the recipe calls for. Good luck! Thank you for sharing the recipe. I would like to give it a try but I have no idea where to get the puffed brown rice. I haven´t seen it anywhere around. Could you advice, please, what it can be substituted for, if anything. Thank you.